She filed a lawsuit against the defendant, and there was testimony that the reason for her fall was that she slipped on what appeared to be watermelon. She argues that the store knew or should have known that the floor was wet due to the watermelon and that a customer could likely slip and fall on that watermelon, which is what happened in this case. In aBoston slip-and-fall case, the defendant has a duty to warn foreseeable persons of foreseeable danger and must act in a reasonable and prudent manner when so doing. 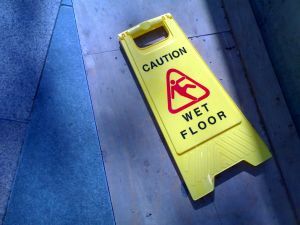 In the alternative to warning a plaintiff of a known danger, such as with caution wet floor signs, the defendant could instead act in a reasonable and prudent manner to get rid of the dangerous condition to avoid a customer getting injured in the first place. In many jurisdictions, this would involve the rather complex and outdated issues of whether the plaintiff was an invitee or licensee and was there for social or business reasons. These archaic terms come from the British common law and apply to premises liability case in most states. However, in Massachusetts, the Supreme Judicial Court (SJC), our highest court, did away with the common law distinctions in premises liability cases and instead imposed a general duty of care as seen in most other personal injury cases. In Edwards, the trial court granted a motion for summary judgment in favor of the defendant and dismissed the case. The reason for the granting of a motion for summary judgment was that the court found that was no genuine dispute as to a material fact as to whether the defendant created a dangerous situation by giving out watermelon samples in a high traffic area. The court concluded this was not enough evidence to establish such a claim, even if the evidence was viewed in the light most favorable to the plaintiff, which is the standard when reviewing a motion for summary judgment. The court also concluded that, aside from the issue of whether defendant created the alleged dangerous condition, the store did not know or have reason to know that the watermelon was on the floor or even if it was aware of the presence of fruit on the floor that this constituted a dangerous condition. Plaintiff filed a timely appeal following the dismissal of her slip-and-fall lawsuit. On appeals, the court first looked at the issue of whether the store created a dangerous condition. The court found that it did not since a third party customer likely dropped the sample of watermelon, as there as never any evidence that the sample distributing employer was ever less than six feet from the where the fall occurred. The court also agreed that the store had no constructive knowledge of a dangerous condition.